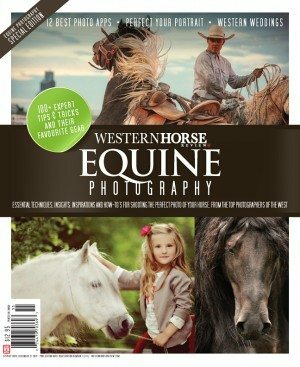 Published in the January/ February 2012, edition of the Western Horse Review. Say the phrase “western wedding”, and many of us get mental images of lace-up Victorian boots and satin fringes. 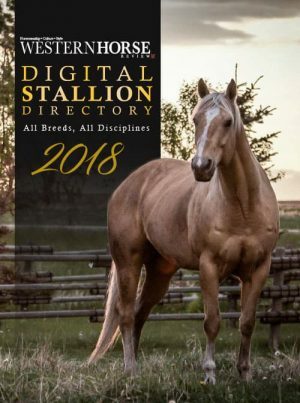 But there is a movement within the engaged couples of the contemporary western world to create a day that bears witness to that which brought them together – the horses that are so important in their everyday lives, the traditions of their western backgrounds and the great, wide open West. 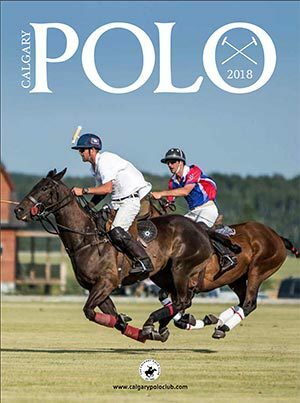 We feature three couples who took these elements and created a day burgeoning with western flair, a love for horses and warmth for each other. Here is part one of our Western Weddings feature. 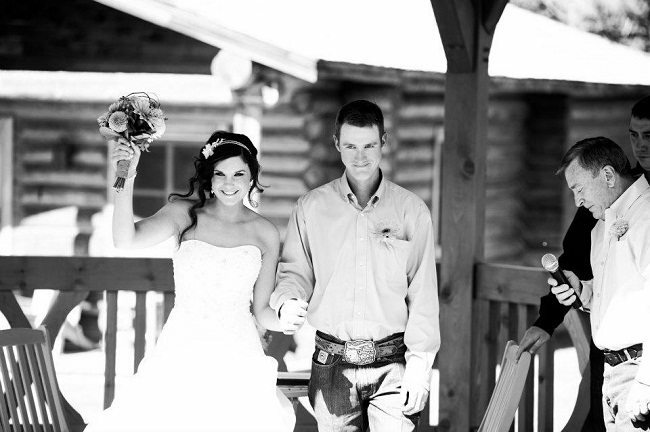 Deanna Paulsen & Jesse Beckley: An old ranch barn served as the ideal backdrop to reflect the couples’ western lifestyle. 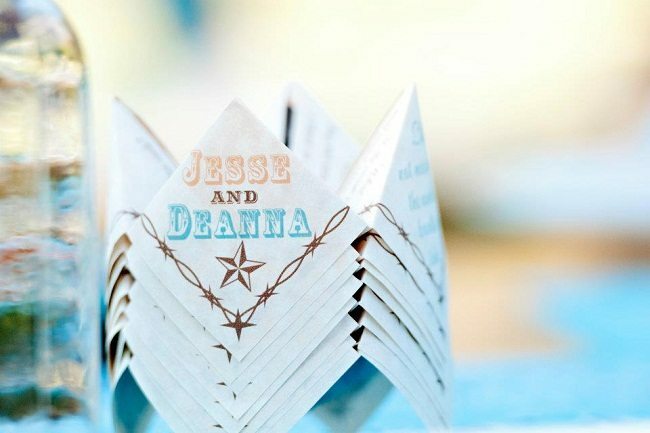 Wedding Invitation: Deanna wanted a rustic wedding invite that represented the laid back ranch wedding she was planning. She worked together with a designer on Etsy.com to put it together, and printed them herself. 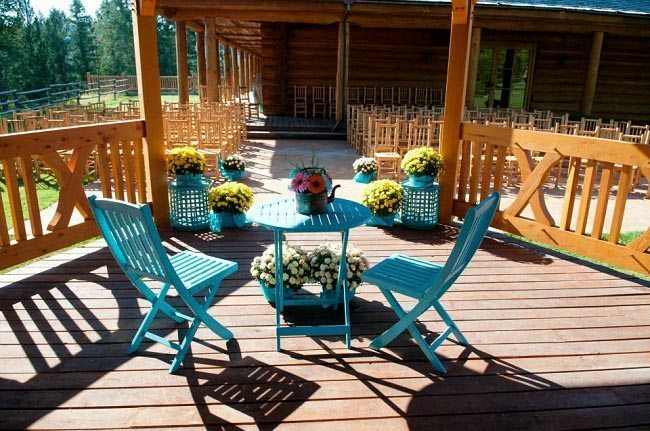 Venue: Three Bars Ranch – Cranbrook, BC. Colour Scheme. 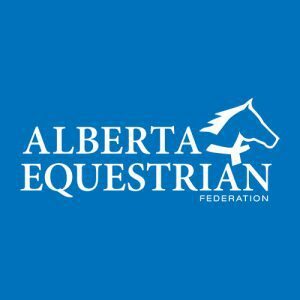 The main color was turquoise – the western world signature color and Deanna’s favourite. The turquoise was adorned with orange and a splash of pink for a very bright and fun color palette. Grooms Attire: Jesse wore a turquoise Cinch shirt, starched Cinch White Label jeans and Rios of Mercedes ostrich boots. 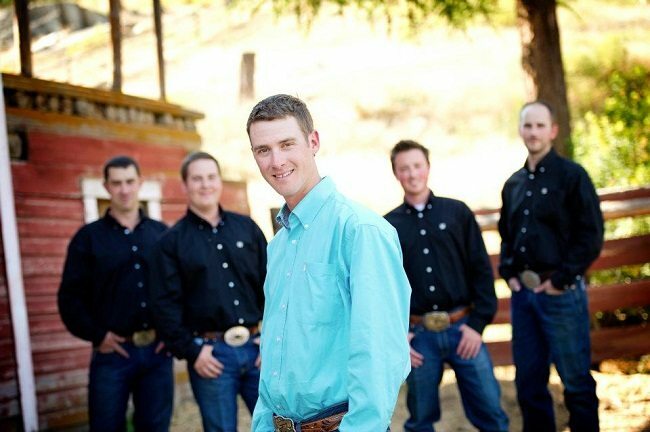 His groomsmen wore black Cinch shirts and Cinch White Label jeans (also starched, of course!). 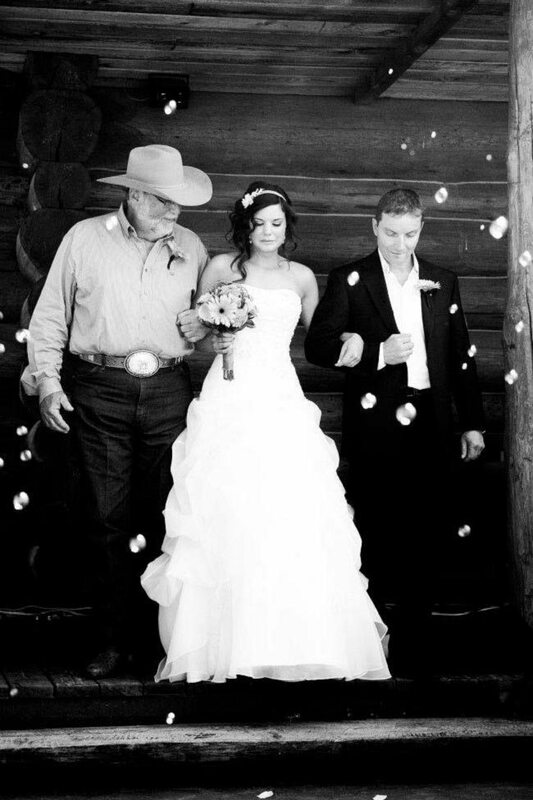 Wedding Gown: Deanna chose a strapless A-line gown from Mena’s Bridal Boutique, Calgary, Alberta. Shoes. 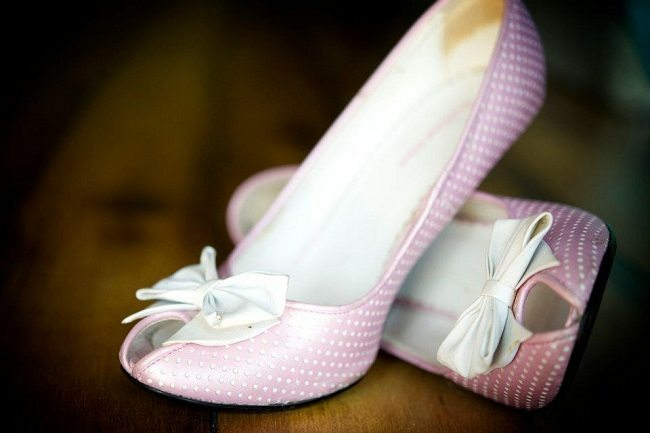 These were Deanna’s “something borrowed”. She chose a cute pair of pink high heels she discovered in her mother’s closet. Jewelry: Deanna kept it simple with a small bracelet and earrings, while her bridesmaids were adorned with chunky turquoise necklaces that she found online. Bridesmaids: Deanna’s bridesmaids had the liberty of choosing their own dresses, so long as they were short and black. Cake: The couple went non-traditional, opting for cupcakes from Craves Cupcakes in Calgary, Alberta. Flowers: For the bride – a beautiful combination of orange and pink gerbera daisies and orange dahlias in her bouquet, adding a splash of turquoise in her centre pieces with the spider mums she chose. 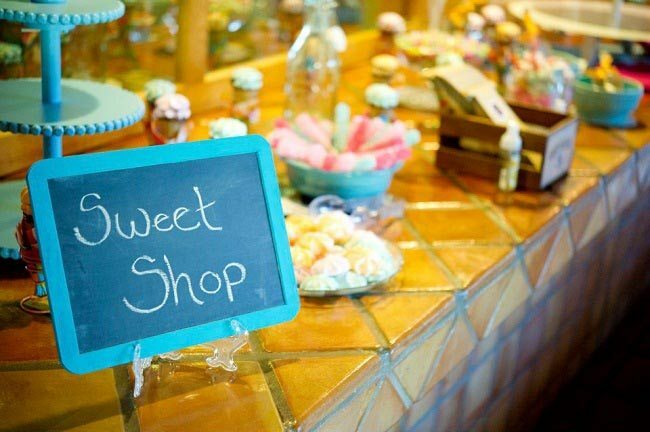 Party Favors: Guests could choose from an array of sweets and take home goody bags full of all their favorites. 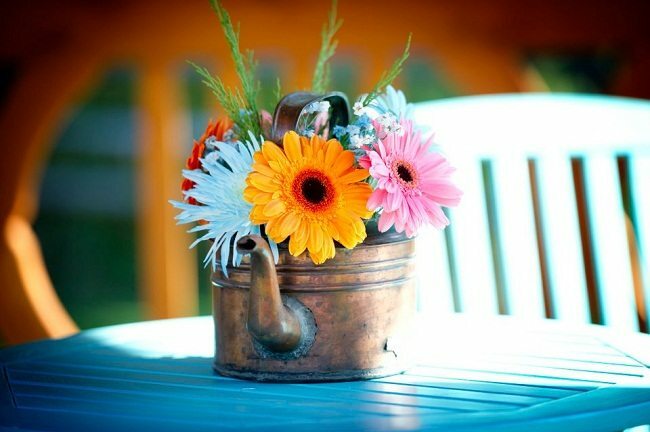 Centerpieces: Deanna used antique turquoise jars from Jesse’s grandmother’s personal collection and filled them with beautiful flowers. 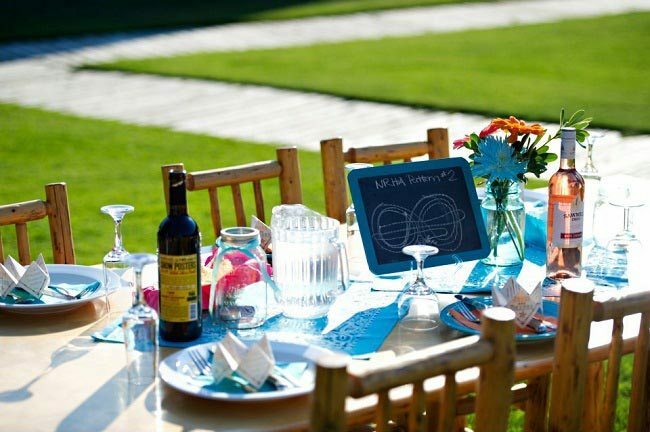 Each table was numbered on a chalkboard, using NRHA patterns 1 through 11 – adding a nice reining-related touch. Wine: The Show, a California made Cabernet Sauvignon. Very interesting. Great photos and idea. I photographed a wedding held in “East Glacier” at a guest ranch in the late 80’s for one of famous rodeo announcer, “Warren Coopers” granddaughters. The backdrop was a field surrounded by mountains. Guests sat on bales and wore their blue jeans. Mother nature has to be co-operative and was. I was completely in my element shooting that ceremony. The rest of the story; I also babysat Linda when she was a little kid. The family ranched just down the road from my home.